Majid Mall, is a part of MISK group a leading business conglomerate with presence in Afghanistan, UAE, Turkey and Europe and was initiated with an objective to not just create physical structures but also to influence lifestyles. Majid Mall, committed to setting benchmarks in retailing in Afghanistan, provides an excellent shopping experience for its customers. Majid Mall combine the knowledge of the Afghanistan consumer and a changing Afghan market scenario in locating, designing, planning and managing retail environments. The mall has universal class and appeal and seek to provide a one-stop destination for fashion, lifestyle, food, and entertainment leading to an international experience. Majid Mall have won many awards since inception and is Afghanistan one of the Most Trusted Mall and also Mr. Mansoor Majid, its chairman has been recognized in various national & international forums for his contribution and commitment in establishing community connect. He is also the Founder Chairman of the Afghan Rugby Federation and one of the most successful businessman from Afghanistan. 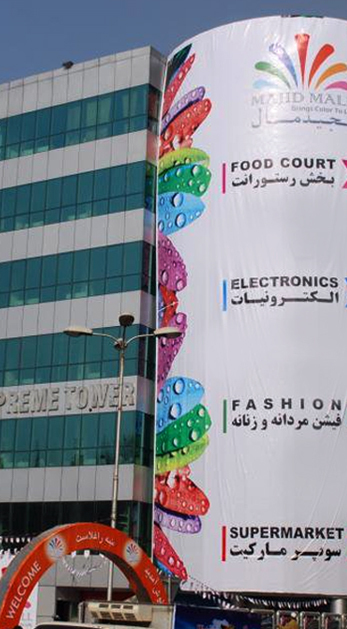 Majid Mall aims at creating and establishing world-class retail and recreation spaces in Kabul. We work at providing a thrilling, exciting and fulfilling shopping, leisure and entertainment experience to our shoppers in a safe and secure environment. Majid Mall comprises of a large team of dedicated personnel who aim at taking it to great heights of achievement in the near future. Majid Mall was started with a mission to become Afghanistan’s most reliable, economical and quality oriented shopping space. With the right foreign expertise and experienced local resources, Majid Mall aims at bringing a whole new perspective to the retail business in Afghanistan.